Since being introduced to Norbert Elias and his idea that a form of detachment (at both institutional and individual level) is a necessary condition for the development of scientific knowledge, I accepted the idea as a useful working proposition. I still do but have always felt, for me at least, that there is unfinished business in this area. The unfinished business can be dated back to when I was working on my PhD thesis in the 1980s. I was studying the then current sociology of science informed as it was by Thomas Kuhn’s ideas (paradigms, scientific revolutions and the incommensurability of paradigms), the post empiricist philosophies of science and the ‘cultural’ turn in sociological analysis. I was also much taken with the ideas of Gaston Bachelard and his notions of epistemological rupture, the emergence of a ‘new scientific mind’, the ‘city of science’, scientific apparatuses as ‘reified theory’ and ‘super-realism’. It was in this context that I turned to Elias’s sociology of knowledge and science, his ontology of levels of integration and emergence, and the concept of detachment. There seemed to be some interesting overlaps in the ideas of incommensurable scientific paradigms (TK) and epistemological rupture (GB), and between the ‘new’ scientific mind (GB) and the development of scientific detachment (NE). I quickly came to the conclusion that a suitably sociologised Bachelard using Elias’s process sociology would be a significant advance in our understanding of science as a process, an institution and a distinctive form of knowledge. And I still think this is the case. However, the approach I took to the natural sciences and my understanding of them seemed rather more radical than what I was reading in Elias. In brief, I felt that the operation of autonomous values made possible through their institutionalisation in science and the ensuing detachment this underpinned from scientists’ potentially heteronomous values were not as autonomous as we supposed. The automatic (and therefore apparently autonomous) orientation of the scientists was based on deeply embedded and embodied values that were not necessarily autonomous in the sense Elias proposed. The autonomous values acting as the unconscious framework molding the scientific process and scientists’ cognitions and behaviours tended to be reductive, atomistic, mechanistic and analytic. This, we are beginning to realise, leads to natural science knowledge in many cases being quite a bit less ‘object adequate’ than was previously thought. Far from being autonomous in a wider context (and adequate to natural processes) these ‘autonomous’ values are quite specific to a particular historical and cultural context. The ‘involved’ valuations of a previous ‘stage of development’ become the ‘autonomous’ unconscious of a later stage. If this is the case, then all we can say about the natural sciences that is different from sociology is that they operate within an institutionalised orthodoxy sociology has yet to achieve. However, there is no denying that this orthodoxy has produced some powerful ‘productive’ knowledge about nature. It is possible that, perhaps counter intuitively, the degree of detachment needed is more likely to be achieved by sociology and sociologists precisely because of the nature of sociology. This is a bold, even arrogant claim that I hope to be able to justify to some extent in future posts. It will also be useful, for me at least, to look in much more detail at Elias’s ideas on detachment and try to unpick in far more concrete terms what is detached, what it is detached from, the distinction between autonomous and heteronomous values, and the constitutive relationship between the scientific institution and scientists as knowledge producers. There are several excellent resources for this, for example chapter 5 in Richard Kilminster’s latest book Norbert Elias: Post-philosophical sociology (please see the bibliography). I have developed my ideas about the natural sciences over the last few years in my work on society and the environment. It will be an interesting exercise for me to revisit my PhD and the Elias’s ideas on involvement and detachment to see how it now fits with my current take on science. For a number of reasons I have become increasingly interested in explicitly ‘critical’ sociology. Of course some would say that sociology is inherently critical, and I would agree. By explicitly critical sociology I mean sociologists and sociologies that go out of their way to announce and establish their critical credentials. Over the last few years I have been using the ideas of Critical Realism in an undergraduate module I teach on the Sociology of the Environment and more recently I have got involved in a project with colleagues and students to produce an on-line student edited journal about Critical Theory. More generally I have been interested in what might be called ‘diagnostic’ sociology for many years. I would include under this heading Zygmunt Bauman, Ulrich Beck, Norbert Elias, and Anthony Giddens for instance. There are many others. All offer a socio-historical account of today’s world and the the problematic position of individuals within it. All imply in one way or another, more or less nuanced, either a critique of modern society or the basis of such a critique. Given that the word ‘critical’ is used in a number of different contexts (the two identified above are the Critical Theory developed within post-revolutionary western ‘revisionist’ Marxism and Critical Realism as developed from the philosophical writings of Bhaskar in opposition to naive forms of realism and positivism in mainly the social sciences but with significant implications for ‘natural’ science as well) I have been discussing with my friend and colleague Richard Kilminster the possibility of writing a paper making the connections and outlining the differences with a view to informing a more concretely specified critical sociology. Needless to say Richard’s input has opened my eyes to a range of related issues and problems and so the paper will have to wait until I have more time for research (and hopefully persuade Richard to jointly author it with me). For the moment, following up one of his suggestions, I have obtained a copy of Futures Past: on the semantics of historical time by Reinhart Koselleck (the most important German intellectual historian of the postwar period according to the publisher but lacking an article in the english language Wikipedia). 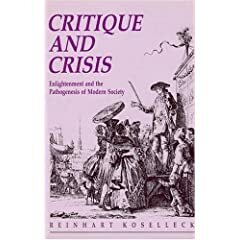 In addition I have ordered a copy of Critique and Crises: Enlightenment and the Pathogenesis of Modern Society. A forthcoming post here will outline what I think will be the relevance of Koselleck’s contribution to a discussion of critical sociology. A brief note on ‘critical’ sociology. Not all conceptions of sociology would claim to be critical. Given that much sociology attempted to model itself on an authoritative ‘received view’ model of the natural sciences which saw science as ‘value free’ knowledge that simply reported on or represented nature as it is, then this is all sociology as a science of society could (or at least should) do. My personal belief is that sociology is inherently critical in some sense but it is not necessarily self-evident what that sense is. Part of this argument rests on the claim that the ‘received view’ philosophy of science characterised above is simply wrong.